Last year, Google Flights added the ability to book Lufthansa flights directly, without having to navigate to the airline’s site. Since then, the German carrier’s been the only airline that offered this functionality, but it appears that you can now book Virgin America flights directly through Google as well. To book your flight, you can search for your desired itinerary and then select your flights as you normally would. Then, you’ll have an option to book with Google as well as with the airline and any third party booking sites, if available. Simply enter your personal and payment information right in Google Flights, and then you’re all set! Even better, since it appears that a booking with Google will still be processed directly through the airline, you should be eligible to earn 5x Membership Rewards points if you use your Amex Platinum Card — however we haven’t been able to test this yet, so we’re not yet able to confirm. 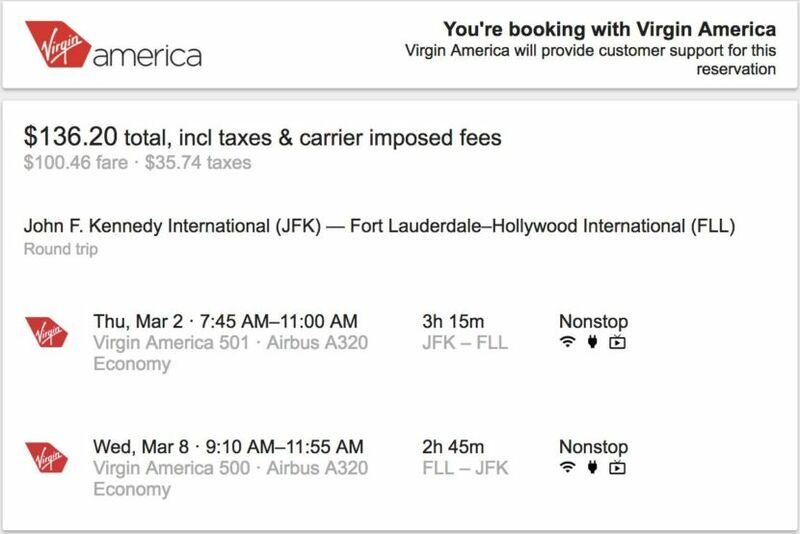 Book directly with Virgin America without leaving Google Flights. Google’s added several features to its already fantastic Flights interface, including the ability to book separate tickets to score the absolute lowest price. While it seems that Virgin America is currently the only domestic carrier to participate in the new direct booking feature, it’s great to see more airlines recognize the utility of Google Flights, and hopefully with the closing of the merger with Alaska Airlines we’ll soon see the option to book Alaska flights there as well. Have you tried booking travel directly through Google Flights?